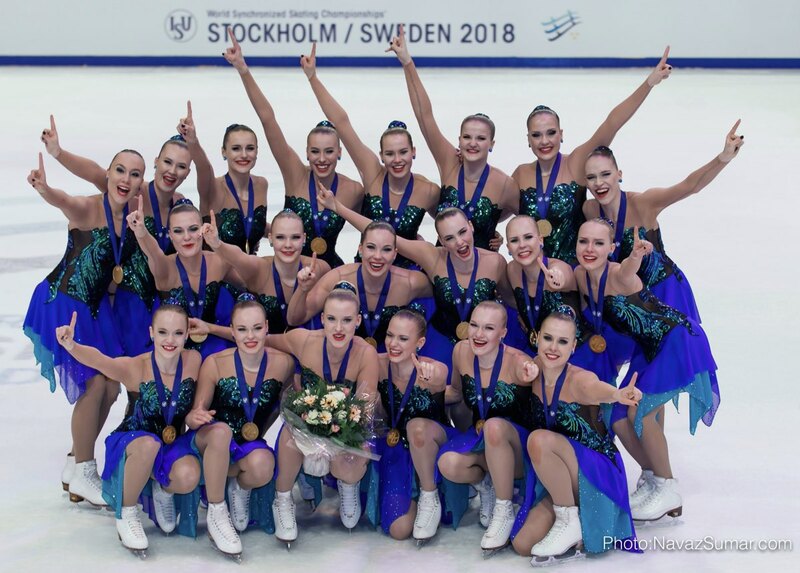 Finnish Marigold IceUnity defeats reigning two-time champion Russian Team Paradise and secures top spot of the podium on Saturday evening in the Ericsson Globe of Stockholm. Swedish Team Surprise returns to podium with a silver medal and Russian Team Paradise gets the bronze medal. Read more to know what has happened in Sweden. On the second day of World Championships spectators and skaters were mightily surprised by the result. 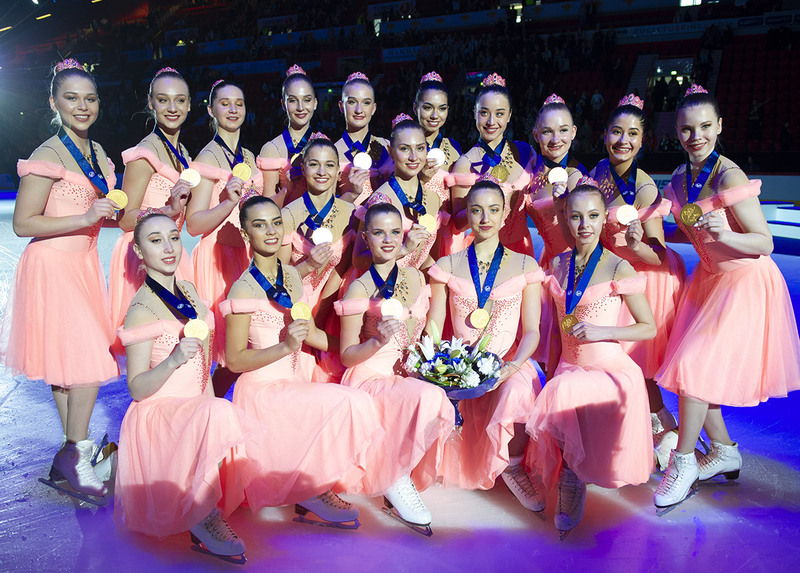 The Finnish champions Marigold IceUnity (SP: 72.61; FS: 136.41; Total: 209.02) outdid themselves once again. Throughout the season, they grew from 191.00 of Shanghai Trophy 2017 to 194.24 of French Cup 2018 and then to Finnish National of 204.60. After the first day of World Championship, they were the third from Short Program and fans were eager to see them break through tough competition. 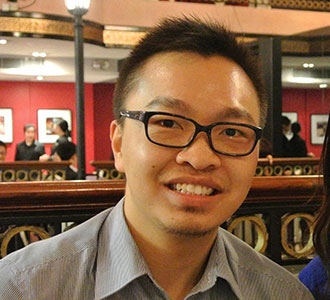 Indeed, they managed to deliver their “Splash” program with almost all elements and additional features called at the highest possible levels. Also, they were able to impress the panel of judges and obtained 10.00 for Performance under Program Components from many of them. Their Free Program was certain a must-watch of this season. Team Surprise (SP: 72.83; FS: 135.16; Total: 207.99) of Sweden delivered their “Mother Nature” program with flying colors as well. They were once again able to get all their elements called at the highest levels and all the elements were executed well. In particular, their group lifts were packed with actions and dynamism so much that they would leave spectators in awe even after replays. Technically speaking, their program was superior to that of Marigold IceUnity but judges rated the Finnish one slightly higher for the Program Components. Fans of Team Surprise may find the 1.03 point difference from the first place hard to accept but Team Surprise have certainty gave it all tonight. Bronze medallist Team Paradise (SP: 76.05; FS: 124.92; Total: 200.97) of Russia led after the Short Program by quite a margin of 3.22 points. And with their track record of this season, their chance to win the third Gold medal in a row was high. Unfortunately, they did not score well in the Technical Elements and the 49.21 score is the lowest of the entire season (c.f. 59.13 to 60.13 from three ISU-sanctioned events). Their unsuccessful second group lift was not helpful to the situation and they had to settle at the fourth position for the Free program. At the overall fourth place is the other Finnish Team Unique (SP: 71.20; FS: 125.17; Total: 196.37). They skated to a programme rich in femininity with music from Postmodern Jukebox. A strong emotion which was matched with facial expressions flowed from beginning to end and carried spectators through peaks and troughs. The one fall during the transition was a small blow to the otherwise smooth skating of the program. The teams in the fifth to eighth positions are very close with a range of only 2.43 points. Another surprise of the day is Team Canada 2 Les Suprêmes (SP: 70.64; FS: 122.24; Total: 192.88) who made to the top five at World Championships. They delivered a clean program of “La La Land” music medley. Group lifts were made to look effortless and their paired sit spins were executed with good and steady speed throughout. In the sixth position is the second Russian Team Tatarstan (SP: 68.32; FS: 124.14; Total: 192.46) beating USA Team 1 Haydenettes who land at the seventh. 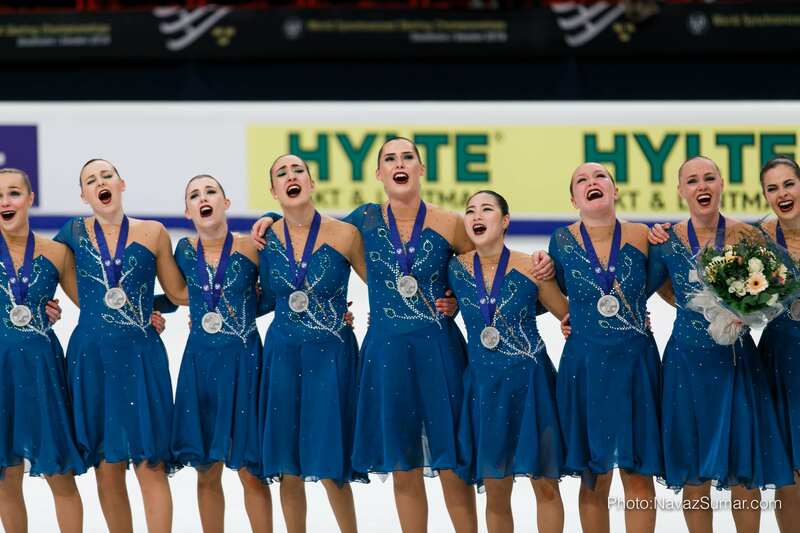 The 26-time US champion Haydenettes (SP: 71.22; FS: 119.97; Total: 191.19) did not score high technically. One group of the second group lift did not end well. 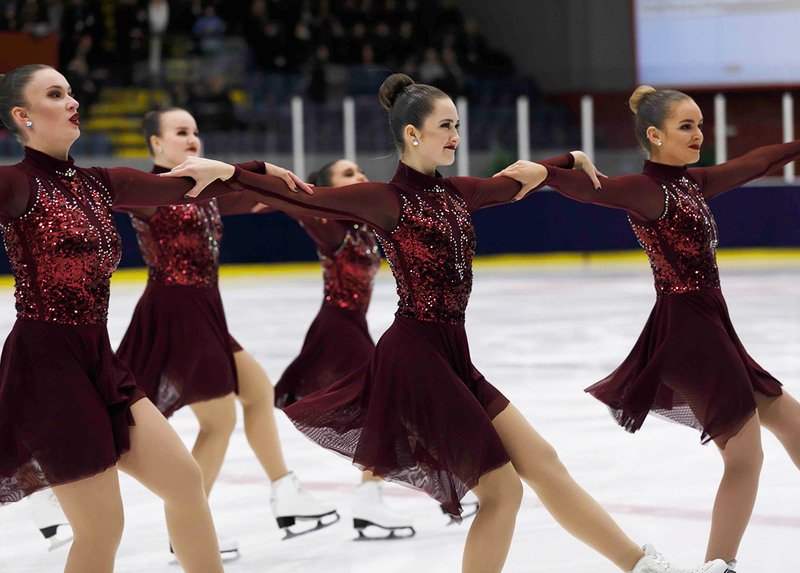 Nevertheless, their “Underground Nightlife” Free program which begins with an uptempo part complements their energetic short program beautifully. Following the aforementioned tough competitors is Canada’s Nexxice (SP: 69.91; FS: 120.54; Total: 190.45) who dressed in impeccable shades of blue and delivered a pleasant and refreshing program of “River”. Their lifted “walking” on river is nice to watch and corresponds well the theme. Team Skyliners and Team Berlin 1 can be said to sit in the next band of scores. USA2 Skyliners (SP: 63.50; FS: 108.50; Total: 172.00) continued their journey of World Championship debut with “Cleopatra” Free program while Team Berlin 1 (SP: 58.23; FS: 110.76; Total: 168.99) of Germany presented a mesmerizing theme of “Creepy Dolls”. Skyliners could have achieved more without the falls at the end of the death spirals. The World Championships signal the end of the season and teams do show maturity by now. For example, Japanese Jingu Ice Messengers (SP: 46.09; FS: 90.25; Total: 136.34) improved much from Spring Cup (SP: 35.64; FS 79.06; Total: 114.70) and tonight presented a pleasant program of Forrest Gump with a smooth flow of emotion which matched well with characters of music chosen. Team Zagreb Snowflakes of Croatia (SP: 32.66; FS: 68.23; Total: 100.89) were able to execute many elements well synchronized among skaters. This was particularly evident in the ending creative element which different groups of skaters timed precisely and executed their actions virtually at the same time. Special mention should also go to Swedish Team Boomerang (SP: 42.67; FS: 92.33; Total: 135.00). Exactly on the anniversary of 2017 April, 7 Stockholm terrorist attack Team Boomerang paid tribute with a program of remembrance. Despite the disappointment from Short Program with untimely falls, they pressed on to deliver another emotional program. Swedish fans in the arena poured out their generous support. This year’s World Championships have been surprising and entertaining to all but on the other hand, it is also heart-breaking for some. Enthusiastic Finnish fans certainly fuelled a lot of energy into the arena. We look forward to the same lively atmosphere in next season’s World Championships to be held in Helsinki.